Charlie’s classic meatloaf is great anytime as a wonderful “comfort food” but Charlie himself says “…I consider meatloaf by any definition, to be a cold-weather comfort-food”. I prefer thick cut bacon that typically can only be bought at the butcher, such as uncured Beeler’s Brand. Trader Joe’s has good choices, as does Butler Meats. I like serving meatloaf with or without gravy but I always garnish with grated sharp cheddar cheese and finely chopped bacon on top. In a mixing bowl, combine salt, pepper, garlic, one tablespoon of the mustard, barbecue sauce, ground beef or ground chuck and eggs. There’s no need to whip eggs before adding to the mix. Once thoroughly blended, add remaining ingredients except for the ketchup and one tablespoon mustard, as these will be used on top of the meatloaf. Make a hand-formed loaf shape and place in baking pan, or if you use a loaf pan (similar to a bread pan), be sure to butter it first so your meatloaf won’t stick. The benefit to using a larger pan with a hand-formed loaf, is the wonderful drippings available to add to the Pan Gravy recipe (below). In a small bowl, blend ketchup, remaining one tablespoon of mustard and two (2) dashes of your favorite chili sauce, mix and brush over the top of the meatloaf. Place in oven preheated to 350 degrees, and bake approximately 1 to 11/2 hours, allowing the meatloaf to reach an internal temperature of between 160 to 170 degrees. I prefer 160-ish. Once done, remove meatloaf from the oven. If you have cooked it in a loaf pan, allow to cool 10 minutes before removing, as the cooling allows everything to “set” and sticking in the pan is less likely. Over medium-low heat, in a skillet 12-inches wide by 2-inches deep (approximate), add 1 tablespoon butter. Sprinkle the bacon into pan and let it slowly crisp up. While bacon is crisping heat, use one cup half-and-half. When bacon is about half done add 1/4 cup finely chopped sweet onions, two cloves finely chopped fresh garlic (not to be confused with two heads of garlic). By the time the onions are translucent and garlic a bit browned, bacon should be crisp. Add 1/4 cup flour, whisking vigorously to avoid burning. When bacon fat and butter oils blend smoothly into the flour, slowly add the half-and-half. Add salt and pepper to taste and a couple dashes of your preferred chili sauce. You should be good to go. Note: The amount of fat the bacon yields varies and determines the gravy texture. If the flour and oil isn’t at right consistency, add more flour or butter as needed. It should be a smooth consistency. If the gravy is too thick either add warm water until it’s the right consistency, or more half-and-half. Cooking gravy is one of those organic processes. It’s one of those cooking things you just gotta feel. 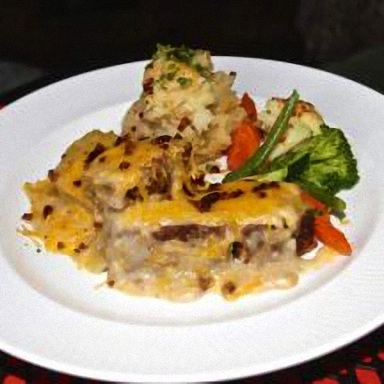 Mashed potatoes also make the perfect complementary side dish to serve with your classic meatloaf.